KITV 4 will host a live debate between Duke Bainum and Mufi Hannemann on Oct. 26. You can participate by e-mailing questions for the candidates now. Heavenli and her "big sister," Kimberly Valente, took pride in a job well done yesterday at the conclusion of Kakaako Kitchen's Pumpkin Carving Contest. Teams from the Big Brothers Big Sisters of Honolulu organization competed for prizes and Halloween goodies. 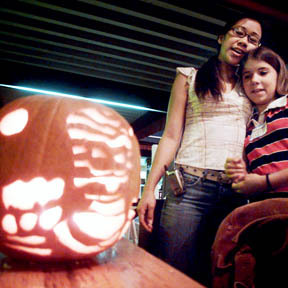 The carved pumpkins will be on display in the restaurant until the end of the month.